Learn which documents you should keep and which files you can destroy. Corporate document destruction is important to protect sensitive information, but it can be difficult to know what files to destroy and what to keep. You may also have records from many years ago, and are unsure when it is an appropriate time to get rid of them. If you have any of these questions, continue reading our document destruction guide for all the answers! There are a number of crucial documents that companies should keep permanently in a safe and secure location. These documents include audit reports, bylaws, cash books, copyrights/trademarks, financial year-end statements, IRS determination or approval letter, insurance records, property records, tax returns, training manuals, union agreements, and more. These files are crucial for companies to store in a safe location- but it is smart to make digital copies of all these records. Paper documents are much easier to lose or end up in the wrong hands, and have a high chance of being destroyed in a building fire or flood. There are a few types of documents that you do not need to store for a long time, and can be destroyed after one year. 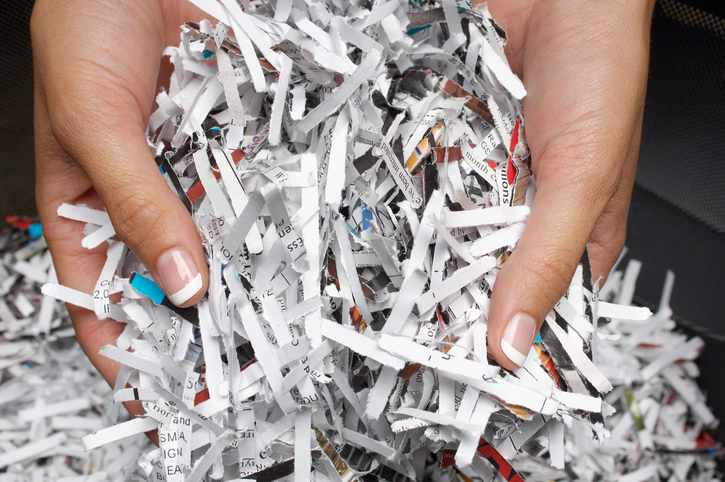 If you are cleaning out your desk or file cabinet of files that are over one year old, the following records should be shredded: purchase orders, receiving sheets, stenographers notebooks, and stockroom withdrawal forms. In between documents to shred and files to keep forever, there is the category of documents to keep for a few years. These files may need to spend some extra time in your file cabinets in case of an emergency, but once two or three years have passed, they are no longer required. For example, you can destroy budget projections, duplicate deposit slips, and employment applications after two years. After three or four years, clear out employee expense records, freight/shipping bills, accounts payable, bank statements, canceled contracts, sales records, and vouchers for payments to vendors or employees. Lastly, after a long seven years of storage, shred accident reports, payroll records, time books, and withholding tax statements. This entry was posted on Wednesday, October 31st, 2018 at 11:54 am. Both comments and pings are currently closed.